The 2011 story had passed me by but I was given another shot at it by a friend who passed on the footage. My first reaction when I saw the headline for this piece was encouragement that someone that old could retain his skills to that degree. I'm not nearly his age (though the clock is always ticking), but even with my trifocals, maybe I can still reach out and touch someone just like I used to – but not as well as this ace. Then I watched the footage. Here is Ted Gundy, an 84-year-old Army veteran of World War II. 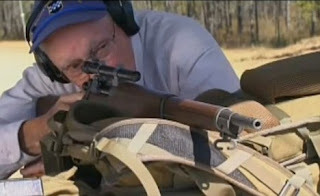 More specifically, he was a sniper during the Battle of the Bulge, and that experience led him these many years later to make an inquiry about how the snipers of today can make such long-range shots. The Public Affairs people saw a great opportunity and he was invited by the US Army Marksmanship Unit to tour the new National Infantry Museum at Fort Benning, Georgia (which I heartily recommend). He was made an honorary member of the AMU and was then taken to the range for some updating on the techniques of modern long-range riflery. But first, as a wonderful homage and touching token of honor, Val Forgett III of Navy Arms presented him with an authentic reproduction of the great Springfield M1903 A4 .30-06 rifle that Private Gundy carried and used so faithfully during the dark, cold, and doubtful days of the biggest battle in US Army history, until he lost it – and his right leg – as a result of a German artillery shell a few weeks later. So, an old sniper and new rifle: the next step was obvious. 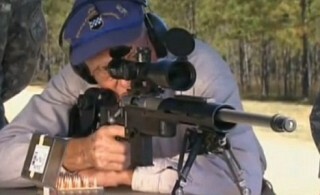 The AMU took him to the range to try it out, at a 300-yard metal outline target, for the first time in 67 years. He carefully took three shots and all three hit the target, all incapacitating with the last round walked into a dead-center-of-mass heart shot. The result is an astounding three-shot group of less than five inches. Better yet, check and see where they all impacted. The Greatest Generation indeed. Thanks to Shooting USA's Impossible Shots for providing the footage, and my camping friend Don Kaag for turning me onto it. To add some more information to the basic story, you can see that Private Gundy (Ret) is wearing the insignia of the 99th Infantry Division. Allow me to fill in some details that he would not, in case anyone is wondering if he saw any action. In December 1944, the new, inexperienced division was dug in the Ardennes Forest in Belgium. The general attitude in the Army at that time was becoming complacent and believed that the Wehrmacht, rolled up after the break-out from D-Day and suffering from the almost-decisive Battle of the Argentan-Falaise Pocket, was essentially finished and it would only be a matter of time before the war was over. At the beginning of the war, the Ardennes Forest was considered to be impenetrable, which is one of the principle reasons that the Wehrmacht drove right through it in their surprise introduction of the blitzkrieg that ended up with the capitulation of Belgium and France and the sight of the remnants of the British Expeditionary Force withdrawn through Dunkirk. Despite this painful lesson, the Allies strangely considered this region to be a quiet sector again. It was at this point on the night of the 16th that the Germans, led by the 6th Panzer Army, launched its Ardennes Offensive, or the Battle of the Bulge. The 99th was among four divisions that took the shock of the surprise attack. The 106th Infantry Division was destroyed and the 28th Infantry Division badly mauled, but the veteran 2nd and the green 99th held, throwing off the German timetable and materially contributing to the eventual American success in the showdown of the Western Front. The 99th bore the brunt of the 3rd Fallschirmjäger and the 277th Volksgrenadier Divisions, and elements of five other divisions, which tore into the 99th at several places, most particularly into three separate battalions, and captured a fuel depot. The 99th, outnumbered five to one, took 20% casualties yet inflicted injuries on the Germans at a ratio of 18 to 1. Their reserves committed, every man of the division fought, including a bayonet charge of cooks and engineer minemen through an artillery barrage to relieve an encircled company, clerks fought off panzers with rifles and bazookas in what had been a rest area, spontaneous counter-attacks were launched because the noise of the continuous incoming artillery was so loud that no one could hear orders, Americans fought back with German weapons and ammunition when their supplies dwindled, an engineer battalion broke out of an encirclement by building a road under fire, artillery fire was called in 'danger close' along the entire front, hand-to-hand combat was common, a communications section assaulted high ground in order to send out valuable information before being beaten back, quartermaster troops fired machineguns while passing out cold-weather uniforms. The stories go on, and all during one of the worst winters in modern European history. After the war, once all the details could be investigated, the Intelligence and Reconnaissance Platoon of the 99th's 394th Infantry Regiment became the most decorated platoon in history for its defense against the attack of the 1st SS Panzer Division, throwing off by some 18 hours the advance so vital to the German effort. Gundy's modesty leaves me ignorant of his precise role in the fighting, other than that he was asigned to B Company of the 393rd Infantry, but I am assured that he is one of the untold thousands who did their duty to their utmost under overwhelming odds. He accepted the gracious honors of his visit in the name of his compatriots of the division, and at the age of 84 he represented them exceptionally well. Awesome. Really, really awesome. Thanks for putting this together.